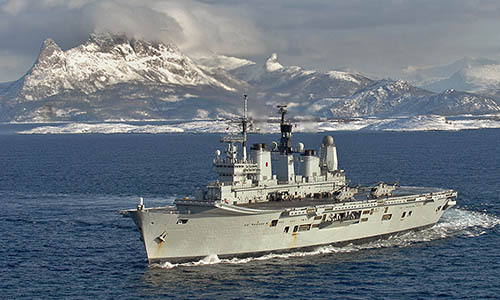 HMS Ark Royal on Exercise ARMATURA BOREALIS - February 2008. January - Portsmouth, Base Assisted Maintenance Period (BAMP). 5th February - Sail from Portsmouth for shakedown and post-maintenance trials. 8th - 11th February - Visit to North Shields. 13th 19th February - Portsmouth. 19th February - Sail for Exercise ARMATURA BOREALIS off Norway. 12th - 13th March - Faslane to store ship and refuel. 15th March - RAS(L) with RFA Orangeleaf. 25th - 31st? March - Visit to Norfolk, Virginia. 1st - 11th April - Exercise CONSTANT ALLIANCE with the USMC. 11th - 14th April - Norfolk, Virginia. 24th - 28th April - Portsmouth. 28th April - Defence Industry Day (at sea). 29th April - Portsmouth for a maintenance period and Easter leave. 2nd June - Sail for Shakedown period. 6th - 9th June - Visit to Liverpool. 14th June - At anchor off St Ives, Cornwall. 18th June - RAS(L) with RFA Orangeleaf. 25th June - Visit by Portsmouth FC with the FA Cup. 3rd July - Sail from Portsmouth. 4th July - RAS(L) with RFA Bayleaf. 17th - 21st July - Visit to Norfolk, Virginia. 21st - 28th July - Operation BRIMSTONE. 28th July - Arrive in Mayport, Florida. 31st July - Captain John Clink joins as Commanding Officer. 1st August - Sail from Mayport. 14th August - Arrive in Portsmouth for a Base Assisted Maintenance Period (BAMP) and Summer Leave. 2nd October - Sail from Portsmouth for Exercise JOINT WARRIOR. 19th - 31st October - Portsmouth. 7th - 10th November - Visit to Gibraltar (includes Ship Open To Visitors). 22nd November - Portsmouth for maintenance and Christmas leave.